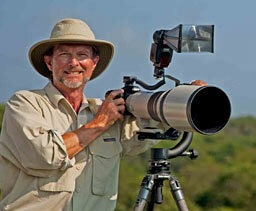 I have been passionate about taking pictures of Nature and Wildlife for over 30 years. Having lived in different countries, I feel comfortable traveling around the world with the goal of capturing landscape, wildlife and underwater scenes and loving to shoot photos of animals to print. I was born in France but spent part of my childhood in Brazil, Colombia and Peru, following my father’s business moves. I have vivid memories of those countries I got to love and know so well and that, from young eyes seemed so exotic and different from France. I started taking pictures at an early age, motivated by the desire to capture the feel and look of those exotic places. In my early twenties I came to the U.S. to finish my studies and got married to Nicki, a wonderful New York girl. I used a Kodak Instamatic to document our honeymoon in Mexico; pleased with the results but wanting more creative possibilities, I bought a used SLR, a Canon FTb and discovered my passion for taking pictures of people, nature and to capture photos of animals to print. I now use Canon DSLRs and I am pleased to display my photos in online photography galleries. 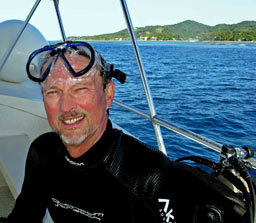 In the early 1980s I discovered scuba diving and fell in love with the underwater world. Once comfortable underwater, I started taking pictures using a Nikonos V with an SB-105 strobe. With this simple tool I captured magnificent underwater scenes in the Caribbean and the Pacific. I now use a Canon DSLR in an Inon housing and Inon strobes. You can see my favorite underwater photos in my online photography galleries. With my wife Nicki, a videographer, as my traveling and diving buddy, I have enjoyed exploring destinations off the beaten path that offer the opportunity to see and photograph wildlife in their natural habitat. We have visited exotic parts of the world where wildlife and people can still be observed essentially as they lived hundreds of years ago as well as magnificent underwater sites: Regions in Africa, Alaska, islands in the Caribbean, Fiji, Palau and Chuuk (Truk) lagoon. I continue to be passionate about shooting photos of animals to print from these exotic areas and many of my best photos can be found in my online photography galleries; and purchase photographs online through any one of my galleries. We make our home in the United States and share our time between Block Island, Rhode Island, and Marco Island in South West (SW) Florida, islands that have been in our lives for many years. I am a member of NANPA, the North American Nature Photography Association.